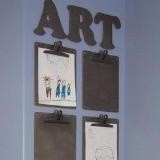 I wanted one of these walls because my precious kiddos are always drawing me pictures and bringing me fantastic artwork. BUT, I never have a special place to put it so I usually end up laying it on my desk and then you know what happens...it gets lost in the paperwork! My thought was to recreate this wall so the kids can clip up their artwork for the entire class to enjoy! 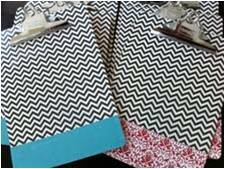 I think once all of the clipboards are full, the next student to bring in a piece can "bump" a piece off and then the bumped pieces will go directly into a binder....a MUCH better system for treasuring their little masterpieces! So, I went to (say it with me) Hobby Lobby and picked up some solid white letters ($2.99/piece), got a few piece of scrapbook paper and some clipboards from Staples. Then, I pulled out my enemy best friend, Mod Podge and got to work. The letters turned out fabulous!! I traced the letters on two pieces of scrapbook paper and then cut them in half. I mod podged half of one design to the top and half of the other design to the bottom. Then covered the edges that met with a piece of ribbon. 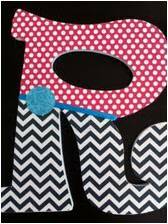 Then I glued a circle of contrasting scrapbook paper to the ribbon and added a top coat of mod podge for a glossy finish! Since this worked so well, I did the same thing with the clipboards. I have a very narrow wall at the back of my room where I'm going to line these vertically. Look for my reveal soon! 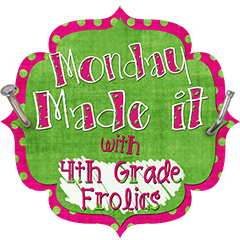 While this next one is not something I made, it was made for my classroom by the fabulous Brooke at Heart's Desire, so I'm showing it off! 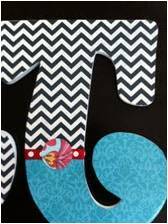 She makes the MOST precious wooden door hangers EVER! I've purchased several from her (turkey, Palmetto Tree, football, etc...she does it all! ), so of course I needed her to make a welcoming monster. Don't you LOVE him? I think he's the PERFECT welcome for my little Mon-STARS!! If you're local to the upstate of South Carolina, definitely check out the Heart's Desire facebook page...you will not be disappointed! And finally, I was inspired by all of the burlap wall hangers being created and made my own burlap pencil - red to match my room, of course. I thought of adding a word to it, but instead, I'm going to use my Cameo to cut a word out of black vinyl and attach the word to the wall so that (hopefully) it looks like it was written with the pencil. We'll see! That's it for now....the big classroom reveal HAS to be just around the corner!! looks fantastic! Love what you did for your art wall....can't wait to see it all up! Your art wall looks great! I may do something like that for my daughter's art at home! 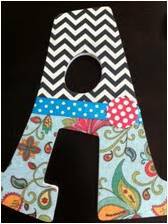 Check out my Classroom Decor Pack of Your Choice Giveaway at my blog. The ART wall is a good idea! I might do that next year. For now, I'm almost finished with my corkboard and it will be where I hang art work, notes and pics. 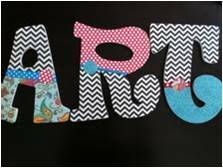 I love your art letters!! Today was my first day and I already have 3 pictures! This is a cute idea - I'm thinking about making a special box to keep them in. 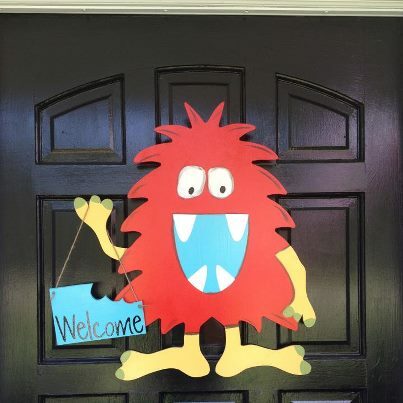 I love your monster Welcome sign! It is TOO CUTE! I love, love, love the art wall idea! !